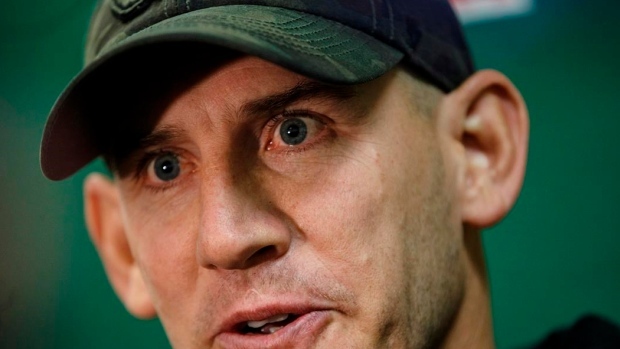 EDMONTON — Head coach Jason Maas has the full support of Edmonton Eskimos general manager Brock Sunderland and both men have already moved on from the controversial call in the final moments of Sunday's 32-28 Western Final loss to the Calgary Stampeders. "Everything Jason Maas does is to win and when he has a conviction about something I trust him and support him," Sunderland said Tuesday as the players packed their bags and began another disappointing off-season. "The philosophy behind it, I understand where he was coming from and I support him. In the CFL in the last two years only one coach has won more games than he has and that says everything." Opinions on the call have dominated conversations in Edmonton since Maas elected to kick a field goal rather than gamble on a third-and-four situation inside the Calgary 15-yard line with less than two minutes remaining in Sunday's game. Edmonton's defence forced the Stampeders to punt with less than 30 seconds left but kick returner Jamill Smith fumbled the punt and Calgary recovered to ensure their trip to the Grey Cup. Maas faced a barrage of media questions about the call Tuesday and reiterated time and again that he doesn't regret the decision and he did what he thought was right at the time. "I went back and forth on the drive home, talked to my coaches, talked to the players and at the end of the day I made a decision," he said. "There was a fork in the road. You could take one direction, I chose the other direction. "My initial thought was, yeah probably should go for it. Then I started to think for a few seconds. I thought, nope, there's a minute 56 at the time. I have a time out. I have a defence I know can stop them … get the ball back to our offence with about a minute 15, with good position with a chance to win the ball game. Those thoughts went through my mind in about eight seconds. I chose what I believed and what I thought was right." Quarterback Mike Reilly and other players who spoke Tuesday all remained firmly behind their coach and his decision. "It's always easy to question a decision after the fact when they don't work out, that's part of the game," said Reilly, the western nominee for Most Outstanding Player. "Ultimately (Calgary) made more plays than us. There were opportunities for us. We took advantage of some of them, but they took advantage of a few more than we did. They were the better team that day and deserved to win it." In expanding upon his support for Maas, Sunderland said the second-year head coach won 13 games this year despite 346 man-games lost to injury, 88 different Eskimos wearing the jersey and 54 different players starting at least one game. "We as an organization won 13 games with a league record for injuries,"said Sunderland. "We didn't end up where we wanted to and that's disappointing. It's pretty hard for me to stand here and chastise a head coach who's had the success Jason has had, and on top of all the injuries we had. It's hard to win 12 games in a perfectly normal year. To win 12 games and then a playoff game on the road … with a league record of injuries, not many coaches can say that." Sunderland, who took over as Eskimos GM last spring, said he remains convinced they have a team that can win the Grey Cup. "We didn't prove it, so we can't say it, but on the inside, that's what makes Sunday so hard." He's looking forward to his first full off-season with the team and dealing with the inevitable player movements. He said the Eskimos have a lengthy free-agent list, but several deals have already been agreed to and just not announced because of the playoffs. Those who spoke Tuesday were all positive about the franchise's future, despite the bitter disappointment of how 2017 ended. "I'm proud of the season we had," said Reilly. "I'm proud of our coaching staff because they went through some seriously challenging times with the roster and the injuries we faced. Had we not had such a great staff we wouldn't have had the opportunity to get into the West Final." It was an up and down season for the Eskimos. They began with a seven-game winning streak, then lost six straight games before ending the regular season with five straight wins to finish second in the west to Calgary. Edmonton beat Winnipeg in the West semifinal. "I'm proud of our season, proud of how we fought and battled all year,'' said Maas. "The end result … is disappointing for the moment, but when I reflect on the season I'm very proud and looking forward to the future. "I'm focused on the future of the franchise and thinking positively about the year. I don't want to listen to all the negativity that's out there, so I chose not to. That's my right. I have big ears. I could listen to a lot of things and I chose not to listen. I don't have to listen, I know what people's opinion is."